Good morning and happy Tuesday. Thanks for subscribing to Axios Media Trends. Send tips and ideas to sara@axios.com and tell your friends and colleagues to join the conversation by signing up here. A reminder: Media Trends is off next week. We'll be back the following Tuesday, September 12th. Over the next five years, the annual global growth rate for the media and entertainment industry will be 4.2%, PricewaterhouseCoopers estimates — slower that the predicted growth rate of global GDP. Revenue streams that have historically driven growth within the industry (like print advertising, music downloads and cinemas) are losing market share in the global economy as cheaper, more efficient digital mediums replace them, like digital advertising, music streaming and digital home video. Agencies report major losses: WPP — the world's biggest advertising agency and holding group — saw shares fall over 10% after it reported that ad spend for the remainder of the year is expected to drop due to political volatility in the U.K. and U.S. and economic volatility in key markets, like Russia, Brazil and China. Havas Group, another major ad agency, missed on Q2 earnings, blaming lowered ad spend from clients suffering from economic issues in emerging markets, like Brazil, Mexico, India and China. They also noted spending cuts in the consumer packaged goods (CPG) category — a big, industry-wide trend. Traditional media continues to fall: Nine Entertainment Co., a major Australian TV network, posted a $160 million loss for the last fiscal year due mostly to a weak advertising market. On the movie front, box office revenue was down 70% this month compared to this time last year, as moviegoing in the U.S. continues to plateau. 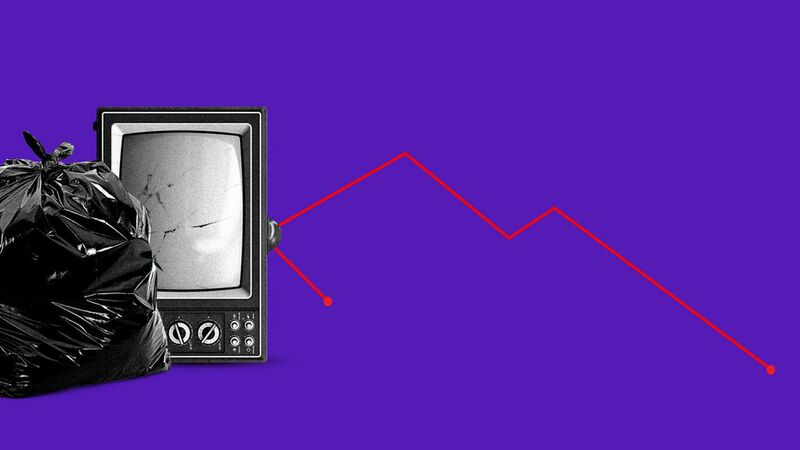 Sound smart: The media and entertainment industry's biggest growth drivers — online video, video games, internet access and digital advertising — are growing rapidly, but not at a rate that's enough to support the major declines of traditional media, almost all of which were down year over year last quarter. Meanwhile, CPG spend cuts drive industry-wide declines: Agency reports of advertising losses in the consumer packaged goods (CPG) and retail spaces is affecting the entire media, entertainment and advertising market, which used to rely on consumer package goods as one of itsa largest growth drivers. Billboards have long been fixtures on the sides of highways and the radio dial has been a permanent staple of the automobile dashboard to cater to the most captive audience in cars — the driver. But those advertising avenues are going to shift as new forms of media compete for the attention of drivers and passengers who will no longer need to keep their eyes on the road. The future of in-vehicle media: Media companies are already looking for ways to take over devices, surfaces and airtime in self-driving cars as human behavior on the road changes. "How cars are presently advertised to will have to change dramatically," said Dan Jaffe of the Association of National Advertisers. "No longer will these ads be able to focus primarily on the drivers' perspective." Kim Hart and I have more from the radio and billboard industries in the Axios stream. 5. Gut Check: "The duopoly has THAT much control." Smartphone apps account for half of all time spent with digital media, according to comScore's Mobile apps report, and two companies own the overwhelming majority of the most-trafficked apps: Google and Facebook. (Snapchat, with 50% penetration among app users, is the top-ranked app not owned by Facebook or Google.) Overall, when it comes to time spent on mobile, 87% of mobile time spent is on apps vs. only 13% on mobile web, even though mobile web often receives higher traffic. Younger users love apps: Users ages 18-24 spend a whopping 66% of their total media time in mobile apps, or 3.2 hours per day on mobile apps. Younger users are more likely to place YouTube as the top app, instead of Facebook, and are much more likely to rank Snapchat as a top app. Millennials are 10 times as likely to delete an app off of their phone due to its appearance, according to comScore's latest Mobile App report. They're also more likely to position apps on their phones based on 'thumb reach,' as nearly 3/4 of millennials consider this when positioning apps on the home screen. Meanwhile, 55+ year-olds are 5 times as likely as millennials to only operate their smartphone with two hands. Spotify: The music streaming giant renewed its a licensing deal with Warner Music Group last week, clearing the way for a potential IPO. It had previously renegotiated deals with Sony and Unversal Music group this spring. It will likely do a direct listing IPO this fall. Axios' Kim Hart explains the direct listing here. BuzzFeed is ditching its anti-banner-ad stance to better cash in on its huge audience, Business Insider reports. "This is a marked departure for the media company, which had firmly rejected traditional banner ads since its inception," BI's Tanya Dua writes. "BuzzFeed instead has pioneered the native-advertising format, driving millions of readers toward its signature posts, quizzes, and videos that are produced as paid advertising. It has long run banner ads that connect to these in-house native ads." CBS buying Australia's Ten Networks, Variety reports. "Network Ten's creditors had included Lachlan Murdoch, executive co-chairman of 21st Century Fox and News Corp., and Australian media magnate Bruce Gordon," Variety's Todd Spangler writes. "The two executives had been said to have considered making a bid of their own." Nearly 300,000 crowdsourced Snaps from people on the ground in Houston have been submitted to Snapchat's "Harvey" story over the past three days, more than four times the amount of submissions Snapchat received during last year's storm in Louisiana. Yesterday, Snap added a new element to the ongoing Harvey "Our Story" that allows users to swipe up on Harvey Snaps to donate to the Red Cross. It's the first use of this in a news-focused "Our Story." Why it matters: Snapchat has been collecting crowdsourced footage to create "stories" for events for years, but its functionality has become more sophisticated with addition of Snap Maps this spring, which lets those in breaking news or emergency situations identify help and resources by location in real time. Through Snap Maps, users knew when the power went out in their friends' neighborhoods or if someone needed rescuing before news outlets could report them.